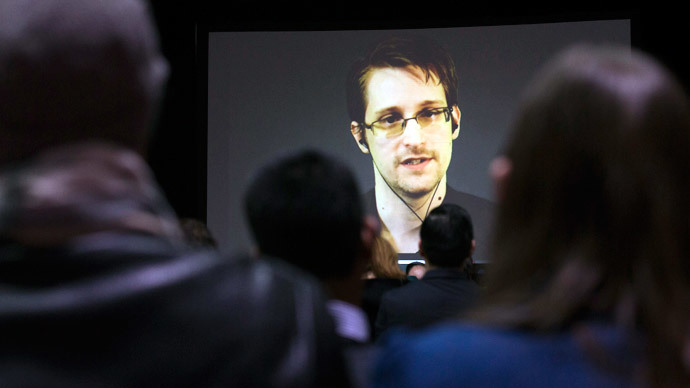 US whistleblower Edward Snowden has publically pleaded with Switzerland to grant him asylum. Calling it a “great political option,” he said that he dreamed of going to Geneva, where he used to work undercover for the CIA. "I would love to return to Switzerland, some of my favorite memories are from Geneva. It's a wonderful place," Snowden told the International Film Festival and Forum on Human Rights on Thursday night, when he was asked about seeking asylum, Reuters reported. “I do think Switzerland would be a sort of great political option because it has a history of neutrality,” he added, speaking from Moscow by video link to a Geneva audience, which had just watched "Citizenfour", an Oscar-winning documentary based on the story of the former US spy agency contractor on the run. Snowden reminded the Swiss that he had applied for asylum to 21 countries, "the majority in central and Western Europe." The United States canceled his passport and he had to stay in limbo at a Russian airport, where he was stopped from going to Ecuador. "Unfortunately no country said yes," he said, blaming the Obama administration’s "political interference." 31-year-old Snowden worked at the US diplomatic mission in Geneva from March 2007 to February 2009, wire-tapping communications systems. At that time, under an online username “TheTrueHOOHA”, Snowden shared his views on life in Switzerland with fellow Americans, saying that it was “like living in a post card,” but also “nightmarishly expensive and horrifically classist,” as cited by The Local. Current Swiss law requires an applicant to be in Switzerland to lodge an asylum request. Snowden arrived in Moscow on the evening of June 24, 2013, on a flight from Hong Kong. He had intended to catch a connecting flight to Cuba. However, his passport was revoked by the US, leaving him stranded in Moscow’s Sheremetyevo Airport. He was granted asylum for one year in Russia in August 2013. A year later, Snowden received a Russian residence permit, which is valid for three years. This period started on August 1, 2014. Snowden has been the recipient of the German 'Whistleblower Prize,' the Sam Adams Award which was presented to him in Moscow, the German ‘positive’ Big Brother Award, the Ridenhour Truth-Telling Prize, and the Fritz Bauer Prize. Snowden inspired not only Laura Poitras, director of the Oscar-winning CitizenFour documentary, but also another US director, veteran filmmaker Oliver Stone, to turn his story into fiction. Stone has purchased the rights to both “The Snowden Files,” a 2014 book about the NSA leaks written by Guardian journalist Luke Harding, and “Time of the Octopus,” a novel based loosely on the Snowden saga penned by the former contractor’s Russian lawyer, Anatoly Kucherena. Shooting is set to take place in Munich this year.